Viewing and cooking recipes on your Thermomix ® is easy with Recipe Chips, which are a unique innovation that brings great collections of recipes directly to your Thermomix ®. Simply attach the Recipe Chip to your Thermomix ® and you can browse through recipes, access nutritional information onscreen and be guided through recipes step by step with the Guided Cooking feature! 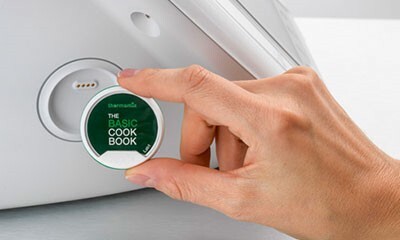 A Thermomix ® Recipe Chip is essentially a digital cookbook, that connects to the side of your Thermomix ®. The Recipe Chip holds over 100 fantastically easy and delicious recipes, which are all accessible from the Thermomix ® touchscreen. Getting started with your Thermomix ® Recipe Chip is simple. To view all the recipes on your Recipe Chip, attach it to the side of your Thermomix ® and select “Recipes” on the touchscreen. You can then explore the recipes on the Thermomix ® Recipe Chip by scrolling through the index. Select the recipe you want, and your Thermomix ® will make it easy to follow with its innovative Guided Cooking feature so you can achieve perfect results. In this mode, the recipes on your Recipe Chip are displayed onscreen with simple step-by-step instructions. The time and temperature needed for every step is preset, so all you need to do is follow the instructions, add the ingredients – Thermomix ® will weigh them for you – and select the recommended speed. It’s a reassuring way to cook even sophisticated dishes with minimal effort and fuss. You can follow recipes at your own speed – just hit “next” to progress to the next step. If you prefer, you can override Guided Cooking at any time, which gives you the flexibility to change settings, be creative and adapt the recipe as you please.